Grace Culpepper, Wife, f, 27, M, md@22, OK KY TN, Teacher-School. Rachel Caudel, Mother-in-law, F, 87, WD, md@n/a, VA VA NC. E-mail written 19 Aug 2011 to Warren L. Culpepper from John Michael 'Mike' Culpepper (#54045), Antelope, CA, e-mail address. William R Culpepper, White, born 1903 in Texas; Resides in San Patricio Co., TX; Enlisted 5 Sep 1942 at Fort Sam Houston, TX in the (Unk Branch) as a Private; Education: Grammar school; Occupation: Geographer, Single; Height: 66 in., Weight: 118. William Riley Culpepper, Male, died 13 Jan 1990 in San Patricio Co., TX. Louis Irvin Culpepper, 21 of Gillett (Karnes Co.) Texas. Born 21 Jul 1895 in Shiner (Lavaca Co.) Texas. Self-employed as a farmer in Gillett (Karnes Co.) Texas. Caucasian, Single, no dependents. Claims exemption from service due to broken ankle. Tall, medium build, light brown eyes and black hair, not bald and no disabilities. Registered 5 Jun 1917 in Karnes Co., Texas. Mattie Tubbs, Sister-in-Law, F, Dec-1882, 17, S, TX AL LA? Jim Dubs, Cousin, M, 27, sng, TX/AL/TX. Laura Culpepper, died 22 May 1913 in De Witt Co., TX, 10341. Russell D. Culpepper, Son, M, 8, S, TX TX TX. Thomas Louis Culpepper, Karnes Co., Dec 6 1926, 42537. Pike Co. Cemetery Records, Unpublished. (Hwy 80 at Hwy 119). Lavaca Co., TX: Matilda E. Culpepper and W. E. Ellis, 23 Dec 1895, Book IV, p. 279. Biography* � James Levin Culpepper was known as "Lev." He was not listed with his parents in the 1870 census. He was listed as "James Levin Culpepper" on the delayed birth record of his daughter, Cecil Hae Culpepper in 1892. On the same certificate, J. L. Culpepper's place of birth was given as "Shiner, TX" but he was probably born at Old Sweet Home which was near Shiner. Mrs. James L. (Vivian Hastings) Culpepper copied the following deed (37?) in which James L. Culpepper donated (for a $1.00 token) an acre of land for a school and cemetery: THE STATE OF TEXAS COUNTY OF GOLIAD ____________________KNOW ALL MEN BY THESE PRESENTS: That I, J. L. Culpepper, of said county and state, for and in consideration of the sum of One ($1.00 dollar cash to me in hand paid by J Gus Patton, County Judge of Goliad County, Texas, the receipt of which is hereby acknowledged, have bargained, sold and conveyed and by these presents do bargain, sell and convey, unto the said J. Gus Patton, County Judge, as aforesaid, all that certain lot or parcel of land lying and being situated in said Goliad County, Texas, the same being One acre of land, taken in the form of a square as near as possible out of the southeastern part of all that certain tract of land containing 750 acres conveyed by Jno. A. Donalson and wife to H. G. Culpepper, C. E. Culpepper and J. L. Culpepper by deed dated 2d day of Nov. 1893, and duly recorded on deed records of said Goliad County Texas, in Vol. V page 741; said One acre of land composes the most southeastern corner of said tract of 750 acres, and is hereby conveyed to the said J. Gus Patton, County Judge as aforesaid, and to his successors in office, for public school and public burial purposes only. _____To have and to hold the above described premises unto the said J. Gus Patton, County Judge, and to his successors in office, forever, as long as the same shall be used for public school and public burial purposes. _____Witness my hand this Sept 2, 1906 ______________________________________J. L. Culpepper. 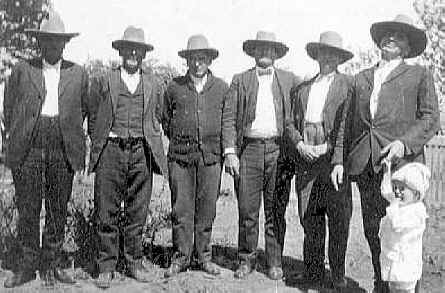 Lavaca Co., TX: J. S. Culpepper and Etna Grant, 3 Oct 1889, Book III, p. 35. H. A. Culpepper, 529 S. Flores St., San Antonio, Bexar Co., TX, age 26, born 1 Nov 1890 in Shiner (Lavaca Co.), Texas, Tailor for Stehlins Bros. at Fredricksburg (Gillespie Co.), Texas, No dependents, Single, Caucasian, Tall height, Slender build, Gray eyes, Black hair, Not bald, No disabilities. Registered 5 Jun 1917 at San Antonio, Bexar Co., Texas. Lavaca Co., TX: Virgie Culpepper and A. J. Grant, 9 Nov 1892, Book III, p. 401. George Garza, -o-, Feb-1879, 21, S, TX TX TX, Day Laborer. Grantee: J. M. Culpepper; Patentee: C. E. Culpepper; 29 May 1900; 64.8 acres; Goliad Co., TX. Maggie Culpepper, Daughter, F, Nov-1885, 14, S, TX AL MS.
Josephine Culpepper, 14 May 1873 – 2 Jul 1925. Josefine Culpepper, Daughter, F, 36, S, TX SC MS.
Josephine Culpepper, Dau, F, 46, S, TX TX TX. Josephin Culpepper, Wilson Co., Jul 2 1925, 27773. Lavaca Co., TX: Georgia A. Culpepper and Robert Little, 17 Oct 1894, Book IV, p. 105. E-mail written 2004 from Lanell Rabner, e-mail address. Jake R. Culpepper, died 26 Nov 1963 in Guadalupe Co., TX. Nannie Culpepper, 13 Jun 1877 – 25 Feb 1950. 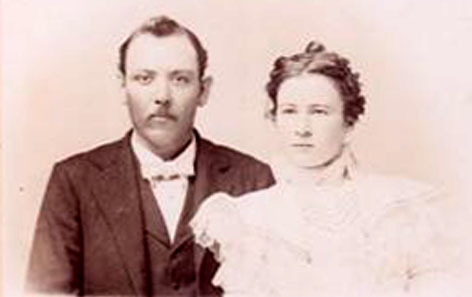 Lavaca Co., TX: Jake Culpepper and Nannie Dykes, 15 Dec 1897, Book V, p. 152. Nannie Culpepper, Wife, F, 28, M1, md-11 yrs, ch 0/0, TN TN TN. Jake Remus Culpepper, Stockdale, Wilson Co., Texas, age 43, born 28 Jan 1875, White, Farmer for self at Stockdale, Wilson Co., Texas; Nearest relative: Nannie Culpepper, Stockdale, Wilson Co., Texas. Medium height, Stout build, Blue eyes, Light hair, no disabilities. Registered 12 Sep 1918, Stockdale, Wilson Co., Texas. Nannie Francis Culpepper died 25 Feb 1950 in Wilson Co., TX.